Students taking part in a previous 'Cultural Challenge'. : image credit- Liying ZhangBangor University is inviting the public to find out about the cultural diversity among Bangor University’s students and take part in a ‘Cultural Challenge’ quiz. Bangor University’s International Student Support Office, who are hosting the ‘Culture Challenge’ are welcoming people to come and watch the competition. The teams of four students, each comprising one student from the UK, one Chinese and two students of other nationalities will each give a 6-minute presentation about the culture of one or more of the team members. The event running between 2.00-6.00 in the University’s Prichard Jones Hall is free, and members of audience will be welcome to enter a quick-fire quiz. All completed quiz sheets will be entered into a prize draw with a chance to win £25 Amazon vouchers. The Culture Challenge will be a great opportunity to learn about the diverse range of cultures we have here at Bangor University. Please come along to support the teams and join in with the quiz! Entertainment and free refreshments will be provided. 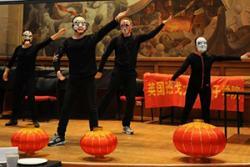 The event is supported by the Confucius Institute.